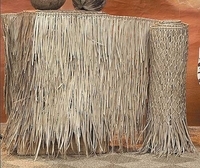 Description of Mexican Rain Cape Thatch Panel: Mexican Rain Cape makes it effortless to convert ordinary structures into tropical island retreats with its shaggy fringe thatch exterior and woven knotted interior. Mexican Rain Cape Thatch Panel Features: Versatile product; can be cut using scissors to any shape between the knots without unraveling. Kind a like cutting a fish net. 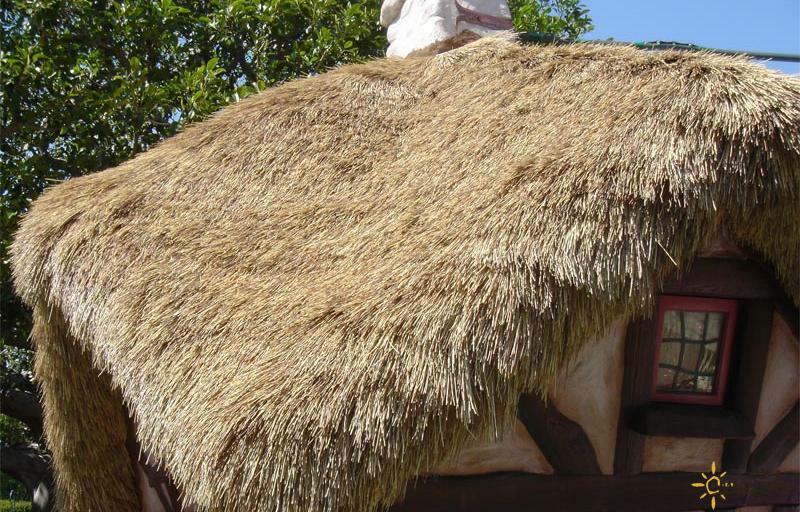 Applications for Mexican Rain Cape Thatch: Apply to a plywood deck with staples or on horizontal 1/2" x 1/2" batten boards to create a more authentic looking thatched roof. Great for Tiki Bar facing. Specifications of Mexican Rain Cape Thatch: Hand-woven palm leaf sheet is for 48" H x 20' H x 1" thick and weigh 44 lbs each panel. You get 2 long thatch panels for this price. Sold individually in one long thatch panel. Can measure up to 54" H x 22" W.
Mexican Rain Cape Thatch Dimensions: 48" H x 20' W x 1" thick. Each thatch panel provides 70-80 sq ft of coverage. Please allow material for overhang also when calculating thatched material. Our Mexican Rain Cape thatching will last 5-6 years outside and indefinitely inside and sometimes longer in dryer climates. Is Mexican Rain Cape thatch waterproof? No; Mexican Rain Cape thatch panels are purely for shade cover and to create a tropical feel for your product. For a waterproof structure multiple layers would be needed.